Last weekend, I spent a good portion of my "free-time" watching the one-hour-twenty-minutes Google Wave demo from the Google I/O conference. Dreaming in Code by Scott Rosenberg (of Salon.com fame). This book was the real-life chronicle of Mitch Kapor's attempt to create an Open-Source, cross-platform, Personal Information Management (PIM) tool. For those who have not read the book, it is a frustrating and predictable (in 20/20 hindsight) failure to redefine email, tasks, notes, calendars, etc. as generic items that a user could work with interchangeably. They understood even then that people worked with email and those other "Outlook/Exchange managed items" differently than was originally intended. That the email often turned into tasks, documents, appointments, and near real-time conversations, and historical records. And, it was all Open Source. Thus, my comparison with Google Wave. In an effort to avoid being Microsoft Exchange (and paying consultants ridiculous amounts of money every month to come in and do care-and-feeding), it was decreed that Chandler would be a peer-to-peer system with no server. To enable the client (and really, the WHOLE system) to be cross-platform, they chose to use Python and a Python GUI toolkit (but most people do not have Python on their machines, the GUI toolkit did not fit their needs--especially considering that the UX was not designed until after they had already chosen that toolkit). As a side note, the GUI toolkit was also Open Source and they often had to decide whether to wait for that team to fix issues or to make the changes themselves, which often delayed the fixing of bugs. As the book finishes, all Chandler ever became was a poor Calendaring system. Disappointing. What, If Anything, Does Chandler's Failure Predict for Google Wave? As I watched the demo, I was acutely aware of the overarching goals shared between Chandler and Google Wave, so I started looking for the signs of failure that were so obvious with Chandler...and I saw none of them. In fact, I saw many reasons to be encouraged that Google Wave was not going down the same paths and has a great chance of success and adoption! Even though they only showed the collaborative creation of a document, Google already has Email, Docs, Spreadsheets, and Calendar, and I'm sure they have the ability to figure out how to tie Calendaring and Office Documents. If they succeed at that...look out Microsoft! This is the team that provided Google Maps, that enabled the coolest Mash-ups, and that clearly recognize that they don't even quite know what Google Wave is going to become. But they recognize that, have solved some very hard problems, and are open with it so we can participate in the conversation about what it should be. I definitely feel the chances of spectacular failure similar to Chandler are nil. It is still early and it will be facinating to see what tie-ins to existing email and calendaring systems will be during some type of transition time. It will be bizarre to see which companies develop their own servers based on the specs and protocols. It will be awesome to see Waves embedded in blogs and news sites and that we can continue to participate in community and conversation anywhere we happen to be on the web or on our mobile devices. Pretty much every project I work on requires the ability to have environment-specific configuration settings: local, development, testing, and production. It's the last thing I ever want to think about when I'm just trying to get my first iteration of a new project working--and I always regret not building it in from the beginning (especially when it comes time to put the project into Continuous Integration). 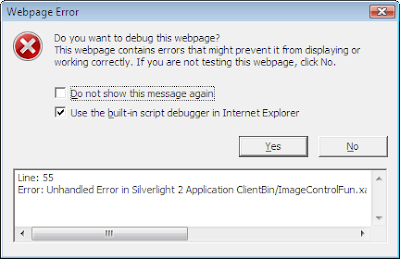 Things are no different working with Silverlight. If your Silverlight application makes any service calls, there is a good chance you need to call different Uri's in each environment. The configuration for these services is stored in a file called ServiceReferences.ClientConfig. Additionally, the web site that hosts your Silverlight application may have the same type of environment-specific requirements. Wouldn't it be nice to have one way of solving this problem? 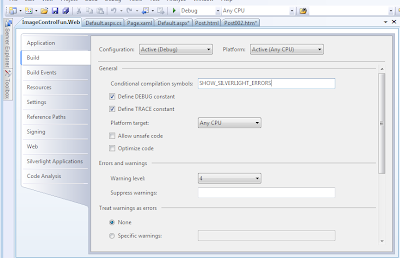 Create multiple Solution Configurations for each environment, and replace the config at build-time using a pre-build command. I've used all three techniques over the years. It turns out that the first two don't make much sense for Silverlight, as the ServiceReferences.ClientConfig is bundled into the XAP file that is created at build time. Sure, you can create some type of post-build step that replaces the ClientConfig file in the XAP, but that could get interesting to manage. You don't have an MSI for a XAP, so that option is out as well. "Here's the general idea. It's not too hard. I'll use an ASP.NET Web Site and web.config as an example, but this will work with most any kind of project, exe's or .dll's." Make environment-specific ServiceReferences.ClientConfig files (instead of web.config). I will only describe the differences below. and paste the original file into configuration-specific files, such as ServiceReferences.ClientConfig.dev, ServiceReferences.ClientConfig.testing, and ServicesReferences.ClientConfig.production (and don't forget the .debug and .release versions to cover your default solution configurations). Here's an example of ServiceReferences.ClientConfig.Testing (notice how the highlighted areas are different between the two files; this is the typical place where all of the ClientConfigs differ). And don't forget to add the copyifnewer.bat file to the root of your project (see Scott's post, lined above) for details on that. Remember, if you use TFS (or some other source control that insists on marking checked in files as Read-Only, you will need to update the .bat file to overwrite without prompting even if the file is Read-Only (xcopy /R /Y worked like a champ). I love this solution as it works locally, within the IDE as well as on a build server using MSBuild, NAnt calling MSBuild, or NAnt calling devenv.exe directly!